The Toronto Maple Leafs have a history of giving up on young players too early. The eternal pessimists believe/fear that every time these players depart the organization they are destined to become stars. This isn’t entirely false, particularly in recent years. Steve Sullivan was waived by the Leafs at the age of 26 and turned into a consistent 60-point player. Fredrik Modin was traded for Cory Cross in 1999 at the age of 25 and became an important component of Tampa’s championship team. The Leafs traded Jason Smith to the Edmonton Oilers, who he would later captain, in 1999 at the age of 26. Those aren’t even that bad. Russ Courtnall was traded to the Canadiens at the age of 24. I don’t think it’s healthy to continue this list, so we’ll stop there. I always argue that if you reflect on past trades and potential draft picks you will drive yourself mad, regardless of your favourite team. I’m not trying to be a sadist, but discussing the Leafs' penchant for giving up on players is particularly relevant at this juncture. I know frustration is moutning with the regression of a few of the team’s young players (e.g. Mitchell, Schenn, Kulemin) and others' inability to even make the NHL roster (Tlusty). Thankfully, there have been no real cries from the fans to trade any of these players... yet. Fans must remember that these players are very young and developing into a full-time NHLer takes time. The best example of sticking with a player, regardless of fan sentiment, is Nik Antropov. He is a true Maple Leafs success story. 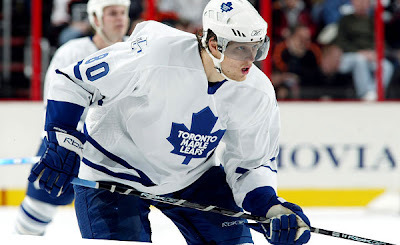 The Leafs drafted Antropov 10th overall in the 1998 entry draft amidst puzzled fan reactions. Most people, myself included, had no idea where Antropov’s native Kazakhstan was, and even less about his skill set. According to Wikipedia he scored 11 goals and 26 points in one international game against hockey superpower Iceland. That's the true reason for his early draft slot. Pat Quinn watched D2 the night before and realized how good Iceland was at hockey. If Antropov could score 26 points against the fearsome Black and Grey then he was the destined for greatness. His NHL career certainly did not start out that way. Antropov made his NHL debut in 1999 and put up a respectable 30 points in 66 games. That total marks the third most games he has ever played in a season. Injuries plagued him each season and the fans turned on the lanky Kazak. Announcing his name as a scratch caused the fans to cheer. I was not immune to this. I was the No. 1 Nik Antropov hater. Playing Antopov guaranteed at least one bad sticking penalty per game. It got to the point where I joked that in Kazakhstan they only count goals and high sticks, thus making Antropov the Wayne Gretzky of Kazak hockey (record holder with 42 goals and 238753832 high sticks in one season). I was convinced Antropov was giving Pat Quinn sexual favours. There was no other logical explanation for his ice time. I was proven wrong on all accounts. Antropov’s real progression occurred in 2003-04 when Antropov and Ponikarovsky flanked my favourite one-year Leaf, Joe Nieuwendyk. The line was dubbed the Sky-line due to their tall stature. Under the guiding tutelage of Nieuwendyk both Antropov and Ponikarovski used their large bodies more effectively and began to dominate the puck down low. I even started to mildly warm up to both players at this point (my Antro hate extended to Ponikarovski based solely on their friendship). After Nieuwendyk left the Leafs stuck the former Eatern-bloc superstars with Mats Sundin. This proved to be a tremendous line combination and proved a tough match for any defensive pairing to handle in the offensive zone. It was almost like a real first line (almost). Antropov, once Toronto’s favourite whipping boy, progressed to the point where Cliff Fletcher rightfully proclaimed him the team's lone top-six forward last season. It took a decade, but Nik Antropov finally began to develop into a player that resembled a top ten draft choice. This is the single incident in the past 20 years that I can recall the Leafs actually being patient with a prospect. The Leafs waited for Antropov through all the knee surgeries, the cries that he was a bust, and most importantly, all the high sticking penalties. The amount of time they waited was maddening, but it eventually paid off. Unfortunately, the team itself did not progress as well and Antropov now plays for the Thrashers. Antropov is continuing his strong play in Atlanta (despite a lack of goals) and I wish him well. He didn’t really fit in with the Leafs financially and he produced a second-round pick. I salute the Leafs organization for their foresight to turn what at one time was a lost cause into a viable top-six forward. Hopefully Toronto continues to be patient with their youth and Leafs Nation doesn't watch Kulemin score 35 goals a year for the Blue Jackets.